Ok. So you saw our How to Make a Fidget Spinner late last week. Since then the messages and comments have been flooding in “Try Fidget Spinner DIY please” and “can we have a template please”. So, I listened. I heard you. And I traced our templates out for you! 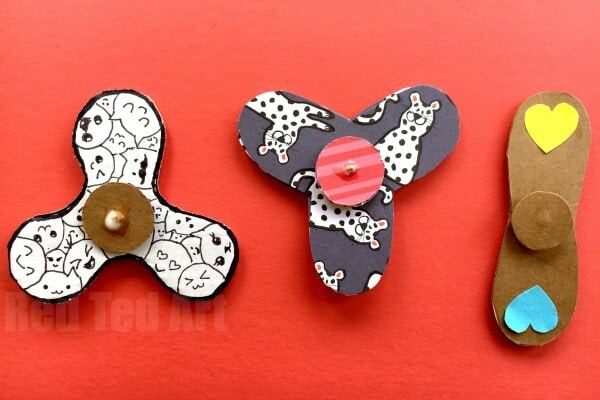 I have 3 free Fridget Spinner Templates for you today – two Tri Fidget Spinners and one double one. Hopefully you will find them handy. 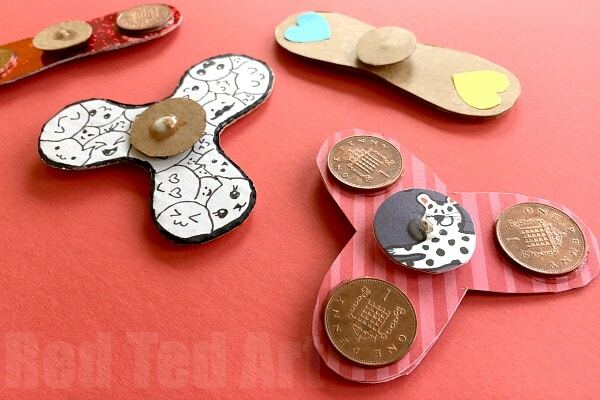 I also had lost of questions from my YouTube viewer community (many kids), about different glues, the need for coins etc.. which made me think, I should add a SHORT piece about the STEAM elements of this fun Tri Fidget Spinner DIY. I talk about it BRIEFLY in the video outlined below, but will highlight key points for investigation in this post for you too. I think this could make a great “up to date” Science Fair projects (you may also want to explore these DIY Paper Toys for Science Fair inspiration!). See our SIMPLE Fidget Spinners. The perfect Craft for Boys! 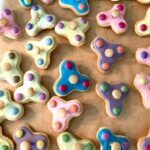 To help your Science investigations along, I have also created a list of DIY Fidget Spinners to check out – from cardboard Fidget Spinner DIYs like ours, to ones using ball bearings (they can be bought cheaply online and in bulk US/ UK (aff links)). Oh.. and unless you are using them for the Science Fair.. here a 5 Reasons to Ban them from the classroom! UPDATE: We now have a set of Printable DIY Fidget Spinner Instructions – step by step photos and how to! 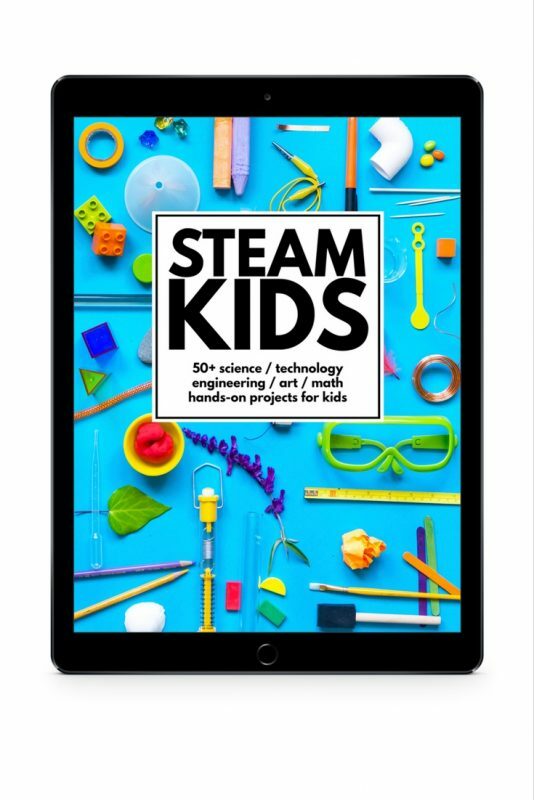 Great for the classroom, summer camps, library schemes and other youth programs. Print this out in A4 format to get the dimensions right. If your local dimensions are different, make sure the settings result in a printed Fidget Spinner template that is 8.2cm (ish) for the dual spinner and 5.5cm (from tip to edge) for the Tri Spinner templates. These are sizes that my kids (9yrs and 7yrs) found easy to handle. 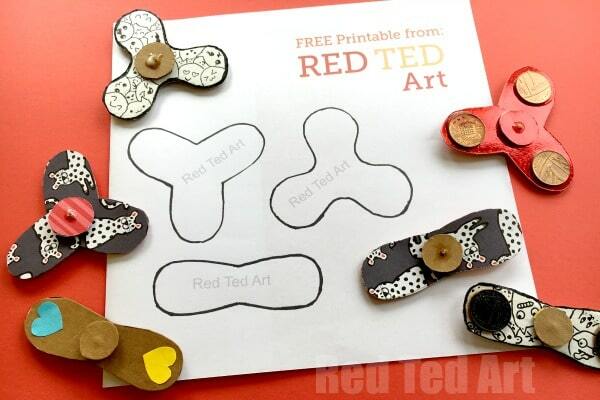 UPDATE: a NEW set of DIY Printable Fidget Spinner Templates here! 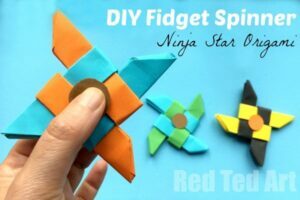 If you don’t want to use a template.. you could have a go at these NINJA Fidget Spinners – use Origami Ninja Stars and convert them quickly and easily! Here are some areas you can look at, the sort of questions people have been asking and some basic (!) answers. Needless to say, I have NOT created a controlled scientific environment for comparing like for like. At essence I am still a crafter!! But I did feel, there are some great areas for discussion here, to get kids thinking and experimenting (I encourage all my YouTube viewers to experiment and report back me!). 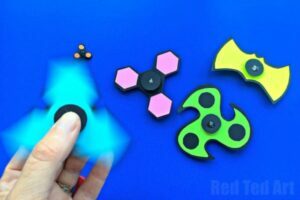 Why not compare your Cardboard DIY Fidget Spinners, will DIY LEGO Fidget Spinners and Ball Bearing Spinners? That would make a brilliant Science Fair project. 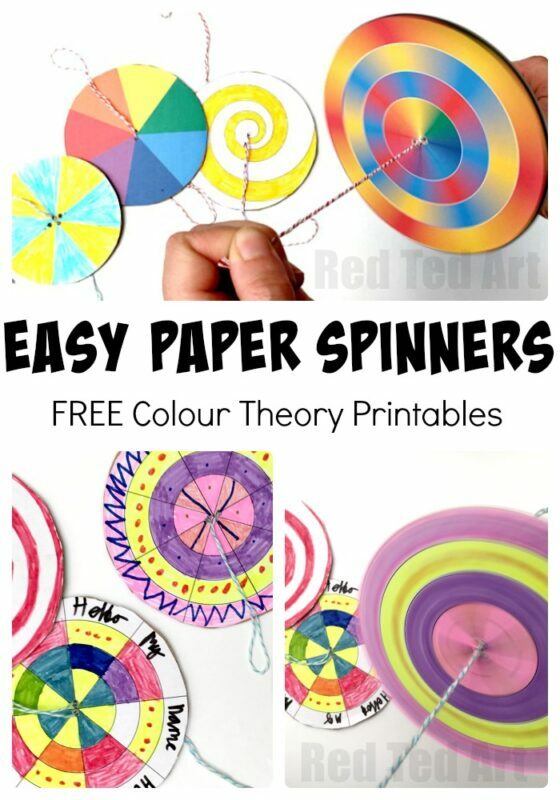 Maybe you can also incorporate some colour theory as per these Paper Spinners? 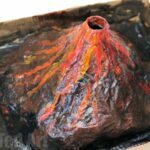 Questions you may asks – Can you use hot glue instead of PVA glue? Can you tape on the coins? What you may observe and some possible answers: A lot of people think that a hot glue gun is “strong glue” than a good “PVA Glue”. Personally, I don’t think that that is the case (actually, you would need to test out different glues and hot glues etc). Why is one glue stronger than another? How does the hot glue work compared to ordinary glue? I find that a hot glue gun shapes and molds around things easily, but doesn’t actually “grip” the material you are trying to glue, so is likely to come apart again. Questions you may asks: How does paper vs cardboard effect your fidget spinner. Why do you need several layers of paper vs one sheet of thick card, or two of thin card? What are Centrifugal Forces? Centrifugal Forces. A centrifugal forces is a force that occurs in a rotating mass or body. It is an inertial force that is directed “outwards” from the axis of this mass. Want to observe a centrifugal force? Get a bucket over water and rotated it round and round. The force pushing “outwards”, keeps the water in the bucket and stops it from falling out. Want to FEEL a centrifugal force? Go on a roundabout on a playground and spin it.. you will feel the “push” of the centrifugal force. Read more about Centrifugal Forces here. Angular Momentum – if something is not moving it has “no momentum”. As soon as it starts to move, it has momentum. The bigger and faster something is, the harder it is to stop or slow it down. Angular momentum is when this movement is around an axis – like a spinning top. You can read more about Angular Momentum here, and why more coins, will help your Fidget Spinner keep going. Questions you may asks: why do you need the coins at all? Doesn’t it spin without the coins? Can you use something else instead of the coins? If so what? What if you add MORE coins (e.g. a set of coins of each side of the Tri Fidget Spinner DIY)? What is Friction? Friction is caused by two materials rubbing against each other. When something is moving across something (e.g. a ballrolling in the grass) it is friction that eventually causes the object to slow down. Without friction it would continue to keep moving (a ball in space, where the is no friction will just keep going). Friction absorbs some of the energy the item has and with the absorption of the energy, slows down and eventually stops movement. High friction causes something to slow down. Low friction, allows an object to move further for longer across another object. 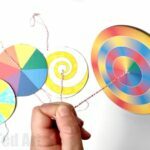 There is another simple experiment you can do at home -creating your own garden Zipwires – a great exploration of both gravity (the moving force) and friction (the breaking force). 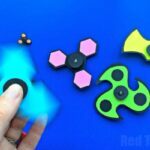 Questions you may asks: why do some DIY Fidget spinners work a bit better than others? How can you improve the spin and reduce the friction? To be honest, this is probably the biggest part of the “make of fail” of your DIY Hand spinner toys. Get the friction wrong and your spinner toy won’t work very well.. get it right.. and it will be OFF! What makes a good fidget spinner diy is a fidget spinner with LOW friction. Ball bearings, which are found in the commercial fidget spinners and also in some DIY Fidget Spinners, are designed to have very low friction (the roundness and smoothness of the “balls”, reduces the friction between them). 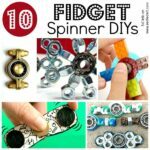 But I am conscious that ball bearings are relatively expensive (compared to a toothpick), so how you can you improve friction on your DIY Fidget Spinner? Make sure the hole for your toothpick is big enough. Make sure the hole for your toothpick is as smooth as possible, with no bits sticking out. You could improve the friction, by inserting a piece of small straw (e.g. from a small juice carton) into the hole, for the toothpick to move freely in. Also the length of the toothpick will influnce the level of friction. Are your cardboard discs touching part of the main fidget spinners? you need the cardboard sticks to help stabilise the spin. But you also don’t want them too close to the spinner… experiment with different widths. A quick and short paragraph about optics (wow, who knew a DIY Fidget Spinner could have SO MUCH SCIENCE!!). Have you noticed that when you spin your Fidget Spinners, the patterns disappear? Or the colour even changes? This is down to optics. How light travels and how our eyes pick up this light and how quickly we can processes it. I have a great (larger) DIY Paper Spinner, where you can explore some colour theory (turn blue and yellow into green!) and Babble Dabble Do, has a great article of the “magic” of spinning tops and white light. And finally.. here is our (second) how to make a fidget spinner video! 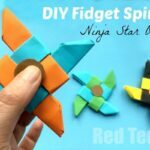 You can see the “simple fidget spinner diy” – the process in essence is the same – so choose which video you find more useful! 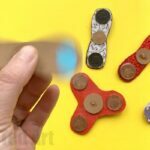 The simple fidget spinner DIY video basically shows me making the spinners using different materials. The second video is a little shorter, and I talk a bit more about the STEAM aspect of the Tri Fidget Spinner DIY. Personally, I find either video good!!! 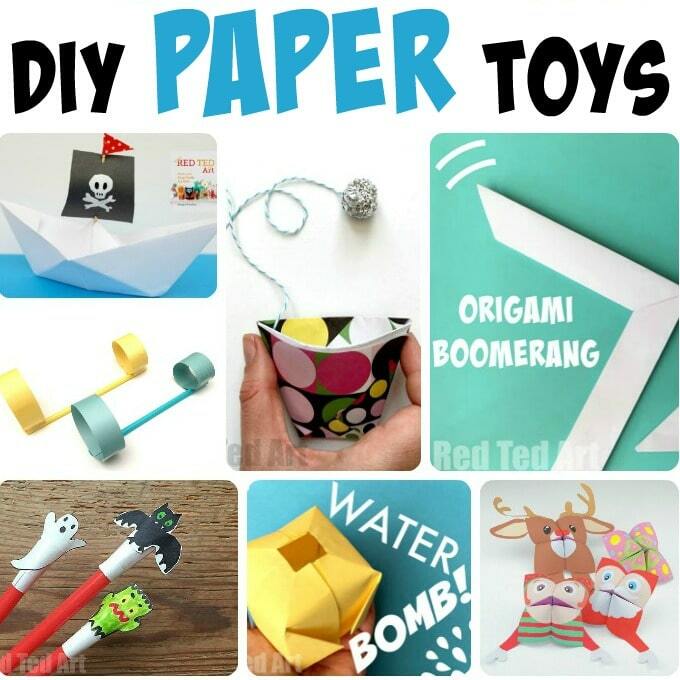 Here are more fun ideas you can make from Paper – DIY Paper Toys! Ooh the holepunch is a great idea! my daughter is now enjoying having a new diy toy. i’ve teached since she was born the values of diy stuff and this is the kind of things that keep her thinking in this way. why wasting money on stuffs we can do ourself. people like you help us raise our kids in a sane way. Thank you for your kind message! And great to find a kindred spirit!! I made these with 2 of my grandchildren and they loved it! To make a suggestion, I found it easier to use a small piece of 18 gauge wire through the center and placed a bead to each end. You must secure one side first then run the wire through the center, place bead then twist wire with needle nose pliers allowing enough space to spin freely. Worked great!! Yes that is a great improvement, I didn’t use that method because many of the kids that watch my YouTube videos don’t have the dexterity for that! But I love it. i love it too but i don’t under stand how to do it and i don’t have PVA glue is normal glue fine Maggy. Yes try normal glue or a hot glue gun? It is such an easy and nice project. Took me only 5 mins to make one. My brother is obsessed with fidget spinner. It is working fine for me and most of my readers.. could it be your malware software? Sometimes they are “super strict”. Or try from a different computer? I found using a jump ring like those used in jewelry making really help it to spin fast. I used two 4mm 20guage jump ring between the discs and the fidget spinner itself. This helped with the issue of it not being completely flat after creating the hole in the center. Overall this was a great tutorial. Also I used a good weight washer in place of the pennies and used poster board (2 pieces glued together) instead of the cereal box. I love your ideas and we will be using them with some students who will love them even more! Just by the way, centrifugal force does not exist – it is a fictional force that appears to exist because the object you are leaning on when you spin pushes on you. All objects spinning in a circle experience a centripetal force, which acts towards the centre of the spin. They also have a sideways motion because they got set in motion in the first place. It is the two motions together (towards the centre and at right angles to the circle) that act to make the object go in a circle. In your bucket example, the person spinning the bucket gets it moving by swinging it outwards and then pulls it continuously inward to keep it moving in a circle. If they let go, the bucket will fly off at right angles to the circle, not directly outwards from the centre. 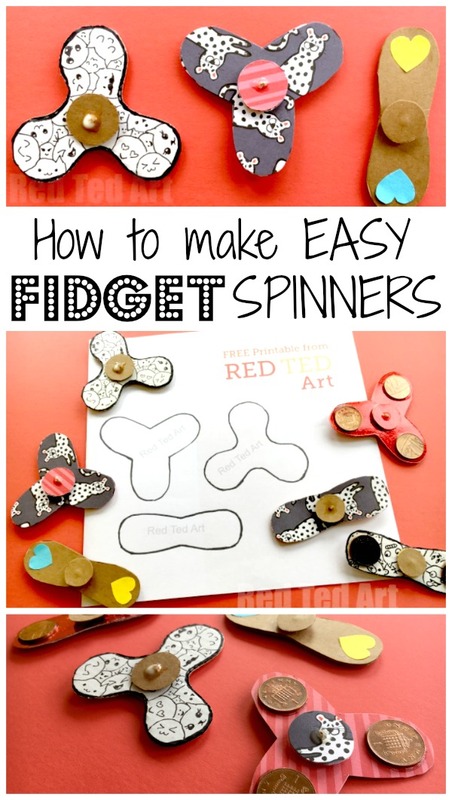 I’m just finding about how to make a fidget spinner myself and head over your template here. This is a complete and insightful instruction guide I must say. Can I share your guide on my blog? Glad you like it! Please use “only one image” and a link back for more information – that would be amazing! Fantastic site..really a marvelous resource. Thanks for being so crafty! 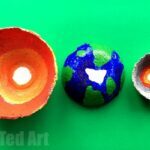 🙂 just curious what age group most of these arts and crafts are for?